More and more specialists in therapeutic professional fields are inspired by sound massage, originally developed by Peter Hess as a holistic relaxation method, because the relaxing and stress reducing effect of the harmonious sounds and gentle sound vibrations may be an excellent supplement and / or accompaniment to conventional therapeutic and medical interventions. The DVD “Peter Hess-Klangmassage als komplementäre Methoden in der therapeutischen Praxis (Peter Hess Sound Massage as complementary Methods in therapeutic Practice)“ provides manifold insight into this, where three of the six articles in the DVD describe fields of clinical application. Mrs. Dr. Glöckner, leading Senior Physician of the gerontopsychiatric department at the AWO specialist hospital Jerichow (near Berlin), was inspired by sound massage when she got to know it for the first time. Since 2010, she and 14 care and social services employees as well as a team of therapists, doctors and psychologists have been integrating sound massage as a concomitant therapy parallel with medical treatment. Many patients of the hospital for psychiatry and psychotherapy, psychosomatic medicine, neurology and special pain therapy are highly stressed, feel under pressure and are often hardly capable of perceiving their body. Therefore, the rapid and deep relaxation arriving with comparable ease in sound treatment is an ideal basis, which can be used before or during therapy. Moreover, sound bowls are an excellent medium for supporting body perception and enabling non-verbal communication. A “touch without touching“ is possible, which may facilitate greater contact between professional and patient. So people suffering from dementia for example react positively to sound; which usually induces feelings of confidence, security and safety. So it is not surprising that good results are also obtained in cases of fear, slight restlessness or sleep disorders. The medical director Prof. Joachim Müller, who is open to new treatment methods and has enabled in-house training for his employees, reports that those applying this body-oriented method also have fun. This substantiates the preventive character of sound massage because therapists always benefit from the pleasant sounds of singing bowls. Employees of the hospital “Klinik am Park“ in Lünen, one of the three locations of the Klinikum Westfalen (Clinical Centre Westphalia) have gained similarly positive experiences. The manager Christian Scholz highlights the personal atmosphere of the clinic, which is noticeable both between employees as well as between employees and patients. Sound massage is applied in many fields here: be it pain therapy, surgical preparation, in surgery after fractures or in employee wellness. The initial aim of Mr. Scholz to introduce sound massage in pain therapy was less for therapeutic benefit but rather as an offer patients felt comfortable with, after which they said, “That was a great thing for me, that helped me, I can really recommend this (and the clinic).” And the management receives exactly this feedback again and again in the form of long laudatory letters with regard to the use of sound. Senior consultants also became attentive and the sound offer was expanded to include additional fields. “The sound has calmed me down;“ and, “I am feeling somewhat relieved. I was positively surprised how sound and also vibration enter the body, this has calmed me down“. 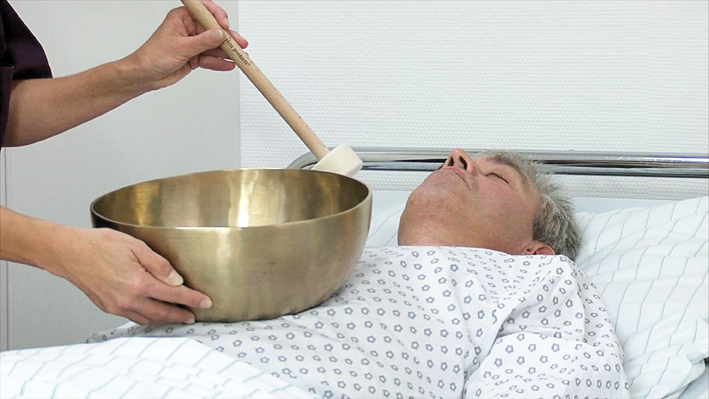 For two years, the pleasant effect of the sound of singing bowls has also been applied at the Arcadia clinic for cancer therapy and integrative medicine at the health centre Bad Emstal, in accompaniment of meditationand relaxation exercises as well as in addition to special therapies. Dr. Christian Büttner, one of the senior physicians, reports how sound massages are used for example in preparation for and accompaniment of therapy for whole-body hyperthermia. Kirsten Knöpfel-Rahmann, one of the attending nurses and a trained Peter Hess sound massage practitioner, shows how she gets patients in the mood for this fever therapy using sound. Her aim is to calm the patient, to quiet him, to relax the body and to encourage the patient’s body perception. The treatment may be unpleasant and in some patients induces fear or aggression. Sound provides an acceptable contrast and helps patients better cope with the situation and feel in control. Within the framework of various relaxation offers sound massage represents an opportunity for many patients to once again experience their body as a pleasant place. Patients frequently notice they are capable of lying down for a longer time without pain. Many patients are thankful for not having to undress, not having to show their scarred bodies and not having to remove their wigs. Disease, frequently dominating the entire daily routine, fades into the background for the duration of the sound session. During this time, it is finally no longer the disease; but the patients themselves as human beings, feeling comfortable in their body, making them feel: I am able to relax. is Dipl. 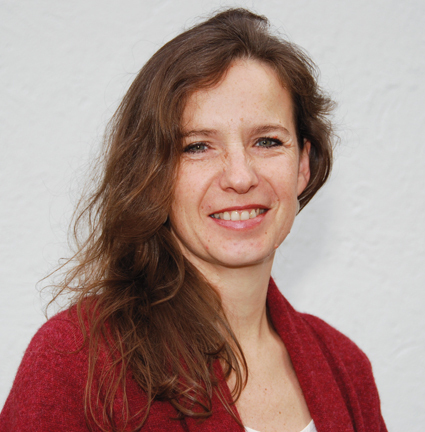 Sozialoädagogin (FH) and earned her doctorate at the University Bamberg about the use of sound in educational working areas. She has been working with the Peter Hess® Institute for a long time. She also is the coeditor of various books published by the Peter Hess Verlag. Nach stürmischem Spaziergang nun die 2. Adventskerze entzündet und Emails gelesen: Ja ich möchte am Gewinnspiel teilnehmen ..
Ich möchte gerne am Gewinnspiel teilnehmen und meine Klangschalen erweitern.